Pretty Me Up! 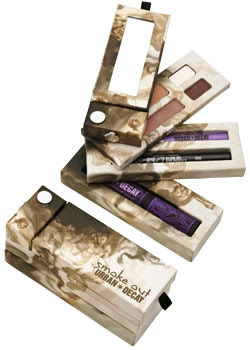 : Urban Decay Holiday: Smoke Out Kit!! Urban Decay Holiday: Smoke Out Kit!! This amazing smoke-and-mirrors kit unveils the secret to the elusive smoky eye! Think you could never get it quite right? Four color-coordinated shadows created for lid, crease, liner and highlight take you step-by-step to a layered eye with depth and tons of attitude. Foolproof instructions and a face chart demystify the process, stashed away in a secret drawer. Rock any intensity of smoky eye, from second date to jaded streetwalker. (We hope you won’t go for that one, actually.) All shades can be worn alone, too! Also included in the kit are travel size versions of 24/7 Eye Pencil in Zero (black), our creamy waterproof pencil, and NEW Skyscraper Mascara. Adorned with exotic wisps of smoke, our sultry kits feature a genius swiveling mirror and swinging layers, kept shut with magnets. Don’t forget: smoky eyes don’t have to be black! We offer black/grey shades, plus brown and deep green kits. omg! that kit looks so cool! urban decay really does have a way with the latest trends! Super cool cute kit! And those are very wearable colors! ooh that looks nice! and the packaging is just irresistable. i love UD! It doesn't look very green?! and they got cheaper with the 24/7 mini packaging! lol, at least the ones I got last year had the original caps :P Oh well, gotta save money yenno! Oooh!!! It`s pretty, pretty, pretty! I love the eyeshadows colors and I think that it`s great that every color has a different size because the white and the black colors will be used only in small areas.